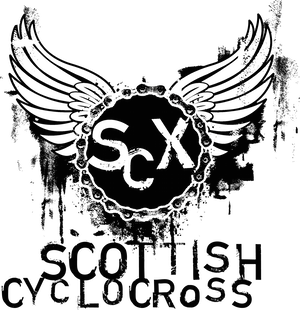 The Scottish Cyclocross train rolled into the town of Plean, Stirling. Followed by its army of 200+ riders, this week’s racing was lining up to be an epic before even a crank was turned. Plean, a SCX classic, hosts a course offering some beautiful / contentious single track, wide open sweeping fast paths and the two big tests; a short, steep bank and the long, lung-busting, leg-buckling climb. The course was superbly laid out by the Striling bike club and to top it off they had a burger van too. Stirling supplied a dry but cloudy day – that didn’t dull the spirits of the competitors. In fact as the Under 12 race kicked off with a massive field of 45 the atmosphere was certainly starting to heat up! Under 12s - Even in the large numbers lining up on the start it was clear The Johnstone Wheelers Jets had a large contingent. With a big age range in the field, from the whistle the riders soon spread out around the course. The lead riders; Michael Hastings, Calum Shackley & Andrew Merry (& lead girl Rhona Callendar) powered off round the course as the main bunch was chased down by Jefferson Keir (& his Mum). A competitive field produced some excellent racing around the relatively long special course. After the allotted 15 minutes duration and some intriguing battles Calum Fernie took the win. Just as well there were a lot of kids as there were a lot of spot prizes! win of the season. In the girls race Louise Borthwick, Cathrine Angus and Jenna Fenwick quickly found their rhythm and maintained their positions throughout the race. Gary & Mick were in involved in some tight racing coming across the line although John & Ian were not far behind and chasing them down. Throughout the first half of the race the front places kept swapping but Gary soon fought into first position and stretched out a commanding 30 second lead ahead of Stevie, Ian, John, Mick who were starting to gap each other in the chasing group. Gary and Stevie maintained their first and second positions with Mick eventually winning the last place on the podium. John finished fourth with Ian coming in fifth. In a SCX exclusive I can also reveal that Mick and Stevie had been spotted doing some “sneaky training” on the course the day before… Preparation prevents poor performance I suppose. Juniors: A close fought battle between Scott Lindsay, Charles Fletcher & Jack Taylor with Scott edging ahead on lap 3 and holding his lead for the rest of the race. It looks like it's going to be a close fight through the season for these guys. Hannah Ferguson recovered from her nasty crash to finish and claim the girls’ prize. Women: Dutch visitor Martina Verweij (riding for Endura and in her first ever cross race) lead from the start but Alexis Barnes never let her out of her sights. Brenda Callander and Lyndsey Carson battled for third, Brenda getting the better of Lyndsey on lap four – upgrading to a cross bike this year is obviously working well for her. Martina and Alexis came across the line together, Martina just pipping it on the post but Alexis was later relegated to last place for a technical infringement. Brenda also took the first women vet prize of a field of five – this is the best turn out of women vets SCX has seen so far and a brilliant sign of how popular SCX has become. If the syle police were out they for sure would have given the top step to Jac Marquis and her fantastic socks! Awesome. A special mention also has to go to Sian Tovey who suffered a broken chain on the last lap and had to go for a lengthy run – chapeau. fraction of a second over this demanding and varied course. The lead changed hands again with Robert taking over before a puncture ruined his race chances and he dropped out. It was then left to James Fraser Moodie to take over, his strength on the climbs showing through as he created a big lead. Davie Henderson (Scottish mountain bike champion) battled hard and was making up ground over the last couple of laps but the damage had been done. The race strung out behind them with big gaps leaving Craig and Paul having a lonely time in third and fourth. On the podium the racers recalled their day with James thanking the organisers for putting in the climb which played to his strengths. Craig responded with saying that James was ‘keeping him honest’ – a hard day at the office for Hardie. Team Turbitt (Steven & Ainsley and friends) SCX Race reporting. Grear write-up guys, good video too! Can organisers advise if Strathclyde park race will allow under 5's to race and maybe some that require a little assistance over bigger bumps. you know in the good spirit it used to be..